As our cities continue to expand and become more densely populated, urban greening is becoming increasingly important. Through our projects and collaborations ASPECT Studios are leading the way towards increasing the amount of urban greenery in our cities. We are achieving this through our approach to landscape and living architecture as green infrastructure. Green infrastructure uses a systems approach that considers vegetation, soil, water, as that integrates with the existing grey and social infrastructure. This approach is a way of providing more greening that will reduce temperatures, manage storm water, provide biodiversity, and improve human health and wellbeing. ASPECT Studios are recognised nationally, and internationally as leaders in green infrastructure and living architecture. To realise these benefits in our projects ASPECT Studios work in collaborative partnerships with a diverse group of professionals, from architects, engineers, water scientists, and ESD consultants, to ecologists, soil scientist, product suppliers, and horticulturists. 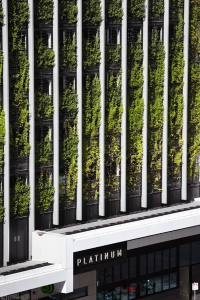 We also work closely with Tensile Design & Construct for their valuable expertise in the structural support systems for vertical gardens and green facades. The award winning relationship between ASPECT Studios and Tensile Design & Construct has helped solve design problems by offering green, sustainable solutions to projects. With their design advice Tensile is able to provide solutions for living architecture projects and bridge the gap between design and construction. Their knowledge and capability with the Jakob product line, which is known for its superior quality. Jakob is an international brand that is trusted worldwide. Tensile are highly skilled when it comes to the Jakob suite of products. Additionally, Tensile has local knowledge of all material, plants, weather conditions and production networks throughout Australia, which ensures the best, sustainable solution. Peter’s background as an Architect is particularly helpful at the design stage. From a living architecture point of view, Tensile offers expertise in understanding how loads, tensile forces, access and maintenance interrelate in a green façade. The green facade and landscaped terraces at Banyule City Council’s new office One Flintoff, Greensborough is a recent collaborative project between ASPECT Studios and Tensile. The project outcome is a successful application of a complex tensile facade structure and vertical tensile ‘hyperboloid’ formations that will support the establishment of climbing plants across the terraces. ASPECT Studios, Fytogreen and Tensile also worked together on the Platinum Tower green facade for Salvo property group. 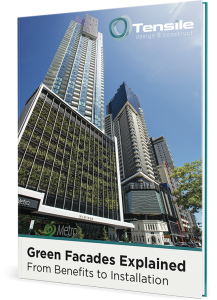 This project involved the construction of a 9 storey vertical garden to the car park levels of a 48 storey residential apartment building and will be one of the largest green façades in Melbourne. The green facade is installed in pre grown planters that also act as the vehicle crash barriers. Testing was undertaken to verify to air movement rates in achieving compliance with the BCA for air quality within the car park as the space is un-mechanically ventilated. 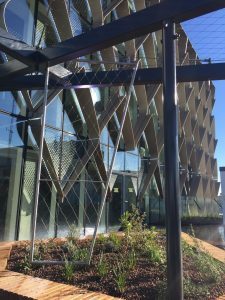 The recently completed roof terrace garden at Barwon Water’s new head office in Geelong is another example of the collaboration between ASPECT Studios and Tensile Design & Construct. The shelter structure supports a sculptural tensile system that once established with climbing plants will offer protection to the occupants from wind and sun. As we continue to work together, our partnership will allow us to expand the number of projects we complete, regardless of their complexity. One of the best reasons for us at ASPECT Studios to work with Tensile is their ability to problem solve on the spot, even when unforeseen issues occur during work. Need help with your next green infrastructure project? Contact the team at Tensile here.